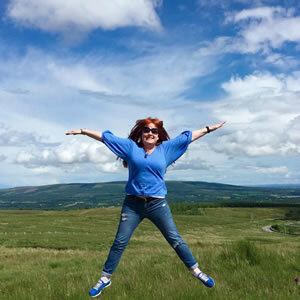 In the course of my travels with Ireland Planner, I come across a lot of interesting people and places that inspire me and make me proud of my Irish heritage, but none more so that Offaly-born Kate Shelly, otherwise known as the Railway Heroine. Kate was born in Loughan, Dunkerrin near Moneygall in 1863, the daughter of Margaret and Michael, a tenant farmer. She and her family emigrated to Iowa in the United States when she was a baby. They built a home near Honey Creek, a tributary stream to the Des Moines River in Boone County. Michael worked as a foreman for the Chicago and North Western Railway and life was good. Sadly, however this wasn’t to last. Michael died of consumption in 1878 and it fell to Kate as the eldest to become the main support for the family (consisting at this stage of mother Margaret and 15 year old Kate, 8 year old Mary, 6 year old Margaret and 4 year old John). Kate worked tirelessly, plowing, planting, harvesting crops & hunting. Life was hard for the teenager, but she was happy to toil for the greater good of the family she adored. 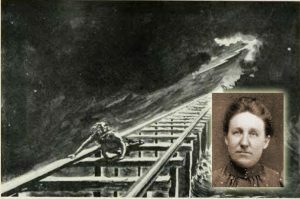 The Chicago and North-Western Railway line ran near their home and a night in July 1881 changed Kate’s life forever. There was a torrential rain & thunderstorm and a pusher train carrying four men which had been sent to test the flooded rail line plunged off the Honey Creek bridge near Kate’s family farm at around 11pm when the bridge fell through. Kate heard the crash and rushed out to see what had happened. It was a tragic sight, two of the four men were lost. Kate found the survivors and told them she would go for help. She knew that the midnight express train from the West to Chicago carrying 200 people was due. If word didn’t get through that the bridge had collapsed then the likelihood was that all 200 passengers would plunge to their death unless the train was stopped. She didn’t think twice. She bravely set out into the stormy night across flooded land with only a lantern to guide her to a depot a few miles away to warn them to stop the train. She had to scramble 50 feet up a slippery embankment to cross the bridge high above the raging river. The span had no floor and cross ties were a yard apart with nothing below but the swollen rapids. She crawled along on her hands and knees and her lantern went out, so she had to feel her way in the darkness of the thunderstorm, slowly pulling herself across each gaping abyss in the knowledge that 200 lives depended on her. Eventually, she reached the other side, and summoned the strength to walk two more miles in the dark to raise the alarm. She practically collapsed from exhaustion when she arrived and at first they didn’t believe her. She insisted that an urgent message was telegraphed to the next town. As a result, the express train was stopped and all on board were saved. Kate led a search party back to the crashed pusher, saving two of the four men who were by this stage clinging desperately to branches above the river. She became a national heroine overnight and money was raised to help her and her family. She won many bravery awards, and rightly so. Having received a lot of accolades and notoriety, Kate went on to become a teacher on a sponsorship. She continued to live and home and look after her mother and family and she taught locally in Boone County. She sadly died in 1912. But the story of her bravery has lived on and the places associated with her name have developed into a tourist attraction in her home county. Today, a train, The Kate Shelley 400, runs from Chicago to Boone and the old station she ran to holds the Kate Shelley Memorial Park and Museum. 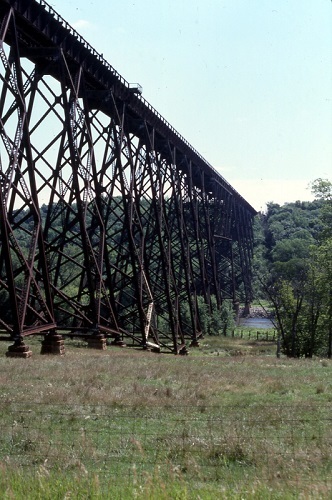 The original bridges have been replaced with a new bridge called the Kate Shelley High Bridge. All reminders of an incredibly brave woman who save countless lives who started her own life in Co. Offaly.